2017 graduates throw their mortarboards into the air to celebrate their success after receiving their degrees. UBC Okanagan’s gym and courtyard will be filled with traditional ceremony, shouts of celebrations and lifetime memories for two days this week. More than 1,750 graduates will receive their degrees as the university celebrates the class of 2018 and convocation takes over campus on Thursday and Friday. 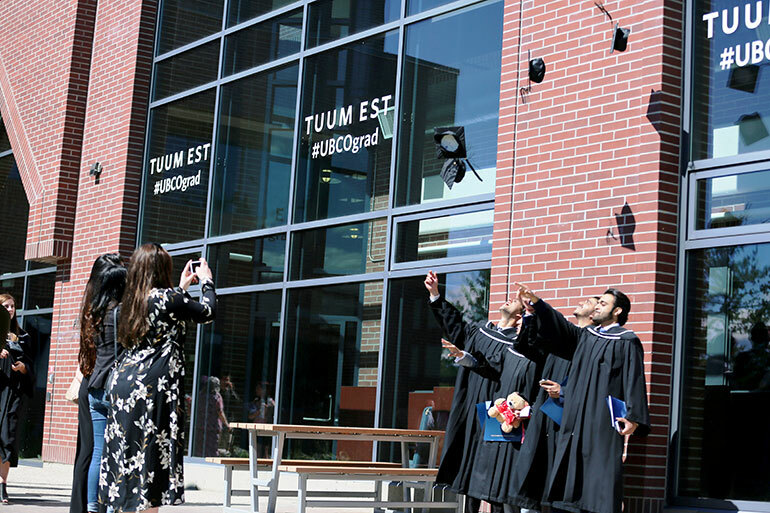 It’s one of the largest cohorts of graduates in UBC Okanagan’s history, illustrating the growth that continues to shape the university. On Thursday, June 7 more than 620 graduates will cross the stage as students in the Irving K. Barber School of Arts and Sciences and the Faculty of Creative and Critical Studies are conferred their degrees. Two honorary degrees will also be issued Thursday. Astrophysicist Victoria Kaspi will receive an honorary Doctor of Science at the 11 a.m. ceremony. Rosalind Williams will be presented with a Doctor of Letters at the 1:30 p.m. ceremony. That same day, chemistry Professor Stephen McNeil will be presented with the Killam Teaching Prize, the first time a UBC Okanagan faculty member has received this prestigious award. The Killam award is given to a professor nominated by students, colleagues and alumni in recognition of excellence in teaching. The Governor General Gold Medal Winner, an award presented to the student with the highest academic accomplishment at a university, will also be presented Thursday morning. There are three convocation ceremonies Friday, June 8 as students in the School of Engineering, the Faculty of Management, the Faculty of Education and the Faculty of Health and Social Development— School of Health and Exercise Sciences, School of Nursing and the School of Social Work all graduate. Mission Hill Family Estate founder Anthony von Mandl will receive an honorary Doctor of Laws at Friday’s 11 a.m. ceremony. At the same ceremony, Education professor Leyton Schnellert will be presented with the Teaching Award of Excellence and Innovation. School of Engineering Professor Yang Cao will also be presented with the Teaching Award of Excellence and Innovation at the 8:30 a.m. ceremony that day. Of the 1,752 degrees being presented this week, 107 students will earn their master’s degree and 33 are being conferred as PhDs. All outstanding achievements, says Buszard.